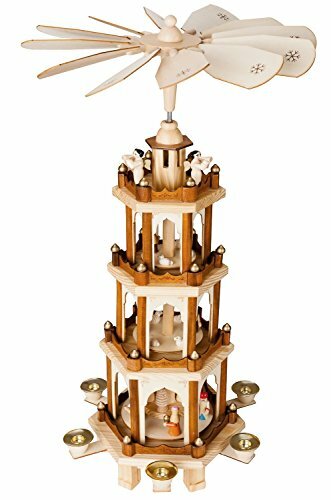 Hand-painted 4 Level Christmas Nativity Pyramid with 3 moving levels, plus the fourth level with the stationary angels at the top. Designed in GERMANY. 3 moving levels, plus the fourth level with the stationary angels at the top. Including 6 candle holders. Candle holders diameter 0.5" - please use candles greater than 3.7''H (not included). BRUBAKER pyramid candles (here on Amazon) fit perfectly.